St James's Palace was built by Henry VIII on the site of St James's Hospital, Westminster. It became the principal royal residence in London, after the destruction by fire of Whitehall Palace in 1698. This bird's-eye view shows in detail the palace and grounds, the elevation of the building and the layout of the ornamental gardens. The Admiralty Office is shown on the boundaries of the palace grounds. Kip, J. 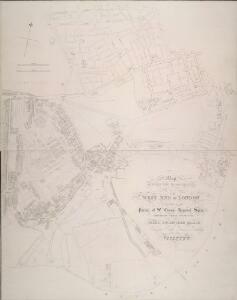 1 : 2400 This is a plan of the leasehold of Earl Grosvenor,later Marquis of Westminster, in Belgrave Square. Earl Grosvenor was granted permission by Parliament to develop the ten acre site in 1826, and commisioned the young architect George Basevi, a pupil of John Soane's, to design the square. Grosvenor's name has been smudged from the title at top right. This is a copy made by Crace in the 19th Century of the Goring Estate in 1675. This is the site on which Buckingham Palace was built. Description: The title of this plan of Hanover Square and the Parish of St George appears with the publisher's imprint at lower right. Compass star and scale bars are featured at top left. The plan shows Buckingham Palace and additions made in the Regency period to the street plan. The Parish of St. George was established in 1725 and extended from Regent Street (then called Swallow Street) to the Serpentine, and from Oxford Street to include the whole of Mayfair, Belgravia and Pimlico.